The USS Ponce (AFSB(I)-15) is an Afloat Forward Staging Base (Interim) operated by the Military Sealift Command (MSC). Image courtesy of US Navy Photo by Mass Communication Specialist 3rd Class Kayla Jo Finley. A long side view of the USS Ponce (AFSB(I)-15) Afloat Forward Staging Base (Interim). Image courtesy of US Navy photo by Mass Communication Specialist 3rd Class Jumar T. Balacy. The USS Ponce (AFSB(I)-15) Afloat Forward Staging Base (Interim) transits the Arabian Gulf. Image courtesy of US Navy photo by Mass Communication Specialist 2nd Class Blake Midnight. The USS Ponce will test a first of its kind Laser Weapon system (LaWS) for the US Navy. Image courtesy of US Navy photo by John F. Williams. The USS Ponce (AFSB(I)-15) Afloat Forward Staging Base (Interim), while being pulled by tugboats into the Kingdom of Bahrain. Image courtesy of US Navy photo by Mass Communication Specialist 2nd Class Ashante Hammons. 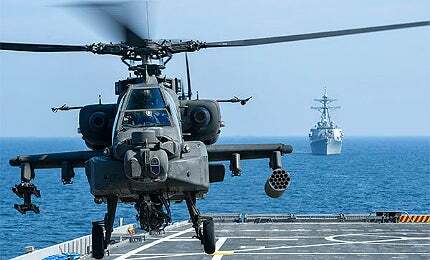 A US Army AH-64D Apache helicopter takes off from the flight deck of the USS Ponce (AFSB(I)-15) Afloat Forward Staging Base (Interim). Image courtesy of US Navy photo by Mass Communication Specialist 1st Class Jon Rasmussen. The USS Ponce (AFSB(I)-15) was formerly an amphibious transport dock ship, which has been converted into an interim Afloat Forward Staging Base for mine counter-measure and coastal patrol vessels, as well as helicopter operations. The ship will also support embarked forces of the United States Central Command (USCENTCOM) and US 5th Fleet. "The US Navy announced that the USS Ponce will be converted into a test bed to deploy first ever Laser Weapon System." The USS Ponce was originally scheduled to be decommissioned in March 2012, but the decision has been postponed in response to requests from US Central Command for an AFSB(I). The Military Sealift Command (MSC) started the conversion of the USS Ponce at Mitsubishi Heavy Industries’ (MHI) shipyard in Norfolk in February 2012. The major refit work was completed by April 2012. The USS Ponce departed Naval Station Norfolk for deployment in June 2012. The refurbishment replaced the bridge equipment and navigation systems with fully automated systems. The work also involved the overhaul of main propulsion boilers and equipment, renovation of galley and accommodation and clean-up of main and auxiliary condensers. In April 2013, the US Navy announced that the USS Ponce will be converted into a test bed to deploy first ever Laser Weapon System (LaWS). The installation of LaWS aboard the USS Ponce is expected in fiscal year 2014. The laser gun will destroy drones, small boats and other air or sea-borne threats. The US Navy plans to deploy such low cost laser weapons to a number of vessels in its fleet in future. The USS Ponce was the final ship of the Austin Class amphibious transport docks, built by Lockheed Shipbuilding in Seattle, Washington. Her keel was laid down in October 1966. The ship was launched in May 1970 and commissioned into the US Navy in July 1991. The ship has a length of 171m, beam of 30.4m and a draft of 7m. The light displacement of the ship is 8,894t, while the full load displacement is about 17,000t. The USS Ponce is manned by 207 crew members, including 152 civil service mariners (CIVMAR) and 55 Navy officers and sailors. The USS Ponce features a large stern flight deck over a well deck for supporting operations of heavy-lift helicopters. Its flight deck can accommodate six CH-46 amphibious transport helicopters, or three CH-53 helicopters. It allows the landing or take-off of two helicopters simultaneously. The deck can also support the landings of vertical take-off and landing (VTOL) aircraft, such as AV-8B Harrier II under VFR conditions. The well deck of USS Ponce can house landing craft air cushion (LCAC) boat or Landing Craft, Utility (LCU), or Landing Craft, Mechanised (LCM) or Amphibious Assault Vehicles, as well as 900 combat troops. The ship also carries supplies and equipment of the embarked troops. The vessel can ballast down in the water for allowing the landing craft and amphibious vehicles to enter and exit the well deck. USS Ponce is armed with two 25mm Mk 38 guns, two 20mm Phalanx Close-In Weapon Systems (CIWS) and eight .50 calibre machine guns. The Phalanx CIWS can protect the ship from small vessel threats, low-flying aircraft and incoming anti-ship missiles. "The installation of LaWS aboard the USS Ponce is expected in fiscal year 2014." The USS Ponce will also be fitted with the Laser Weapon System (LaWS) built by the Naval Sea Systems Command. The LaWS can destroy unmanned aerial vehicles (UAVs) and swarming small boats by releasing a solid-state infrared beam. The weapon can be paired with the radar system of the Phalanx CIWS or other targeting source, for target acquisition. The USS Ponce is powered by steam turbine propulsion system integrating two Foster Wheeler boilers, two De Laval GT turbines and two propellers. The propulsion system generates a total power output of 24,000shp. Auxiliary power is generated by four electrical power generators powered by boilers. The gen sets provide electricity for the ship systems. The propulsion system provides a maximum speed of 21kt to the vessel. USS Abraham Lincoln (CVN 72) is the fifth vessel of the Nimitz-Class nuclear-powered aircraft carriers. USS Enterprise (CVN-65) was the first nuclear-powered aircraft carrier and the largest active warship in the world.